There are times that I feel like I am playing catch up to get my next blog post ready. I knew I wanted to be a part of Marty's fall cloche party, but I didn't get my post ready as quickly as I wanted, everyday life keeps getting in the way. I've seen so many great cloches out there already. 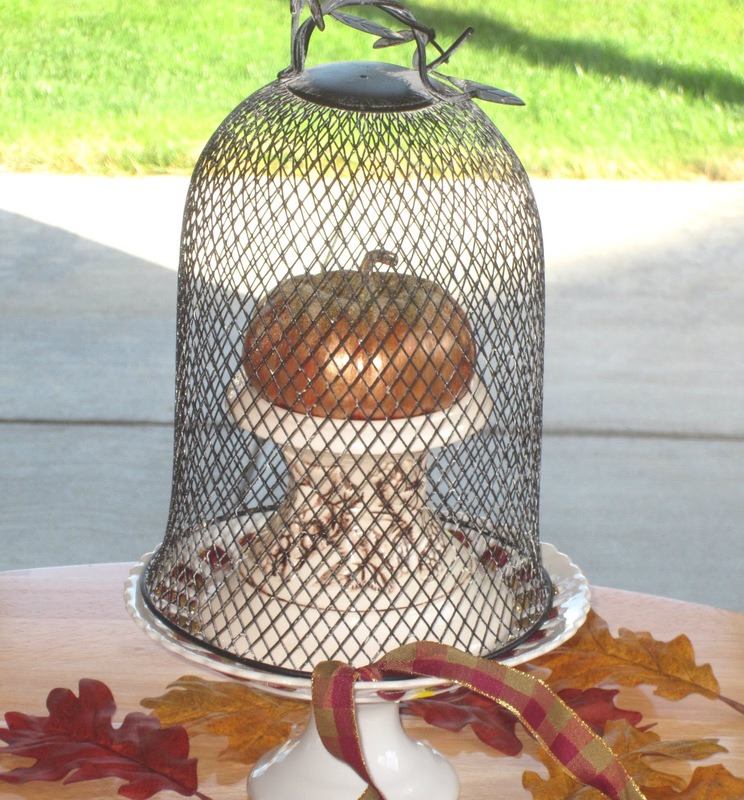 I have just a few cloches, some mini ones that I shared at Marty's last cloche party, and a new wire mesh one. 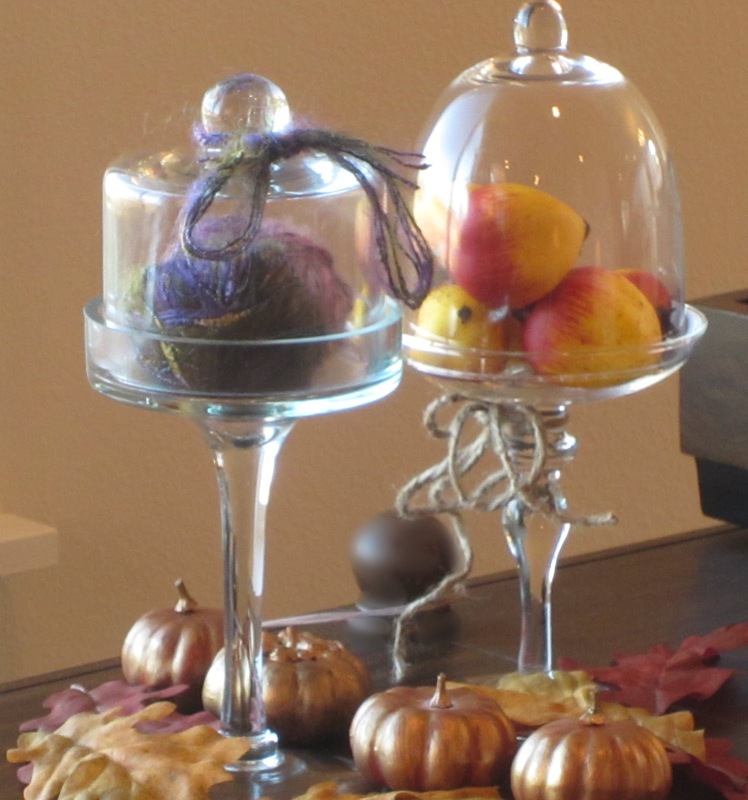 I do love cloches, so I look forward to adding many more to my collection. This is a simple vignette I came up with for our living area. I wanted as much light as possible so I opened the blinds to take advantage of our fading sunshine. 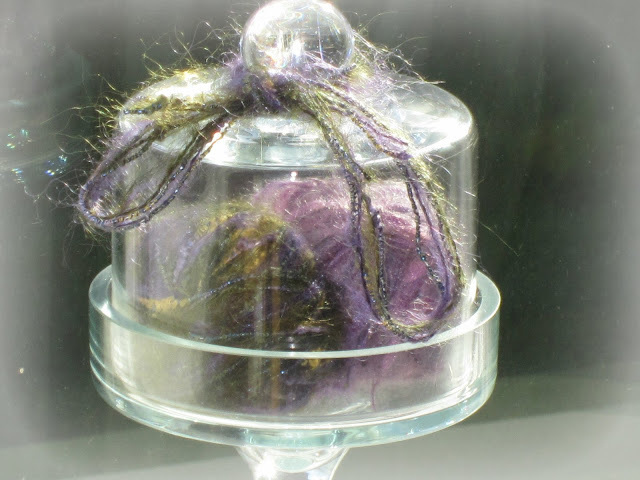 The wire cloche has an unusual top, so I was undecided on how to decorate it. I have it with and without leaves. I found a stand for the cloche with ribbon at Ross's. I added a small fall pedestal and a glittered pumpkin. 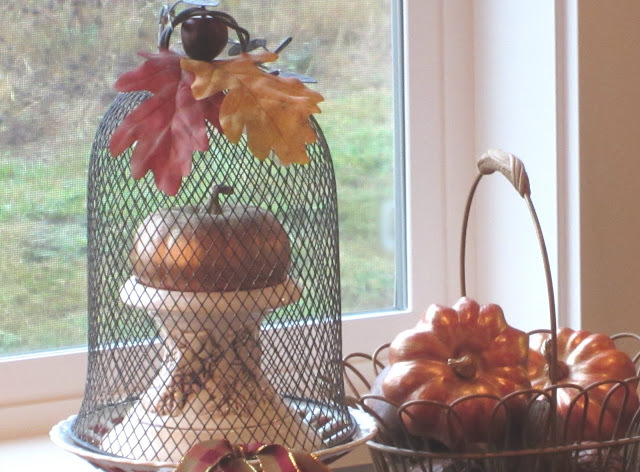 I used a basket that I already had for more fall decor. 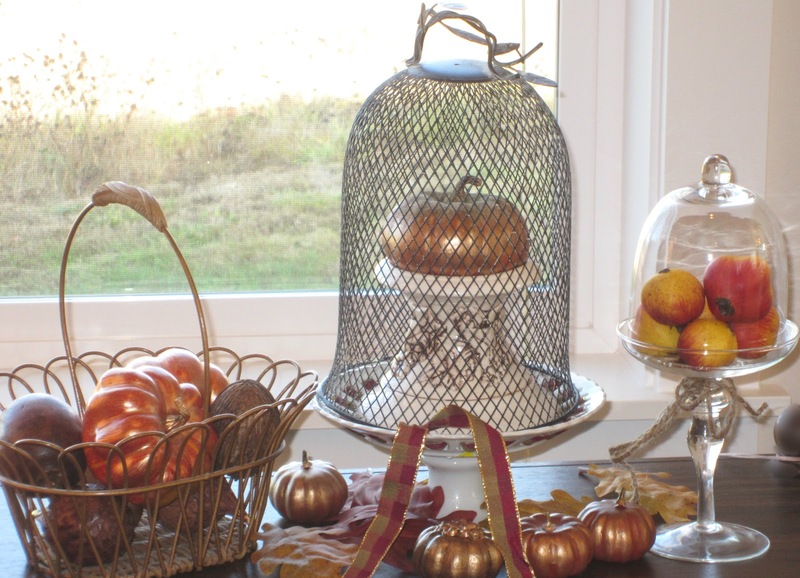 Some more pics of the pumpkin cloche. The stand was such a great find, especially with the fall ribbon included. 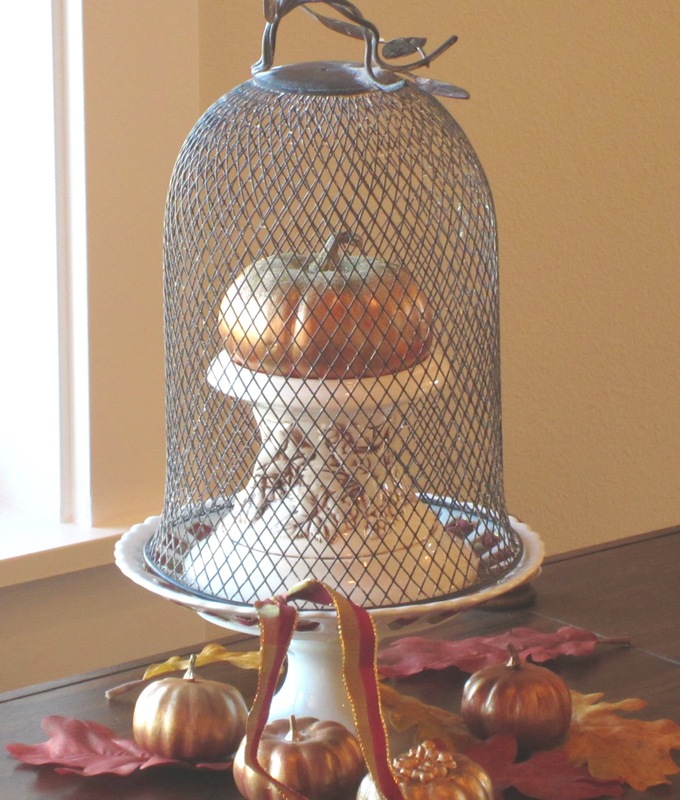 The pedestal for the pumpkin was a thrift store find. 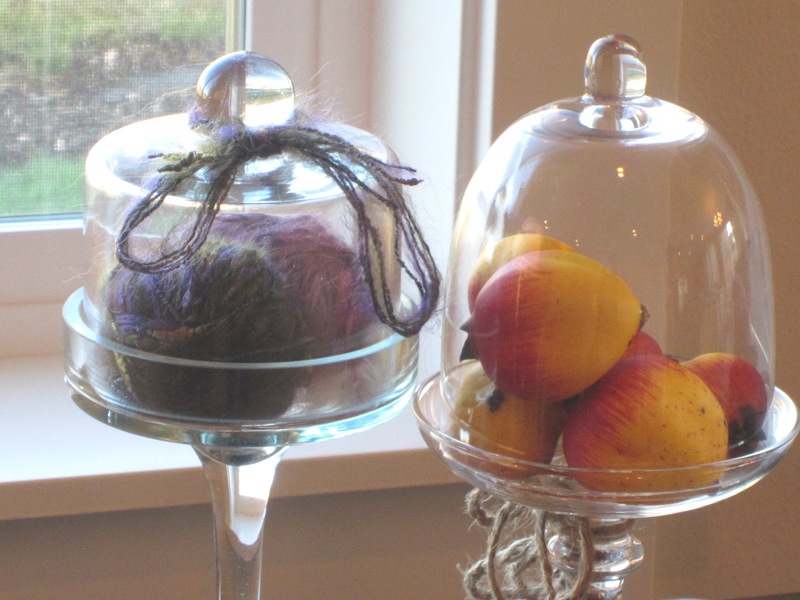 I decided to use some faux persimmons and yarn in my mini cloches. I've knitted in the past so I had a nice yarn stash to choose from. I like the contrasting colors. 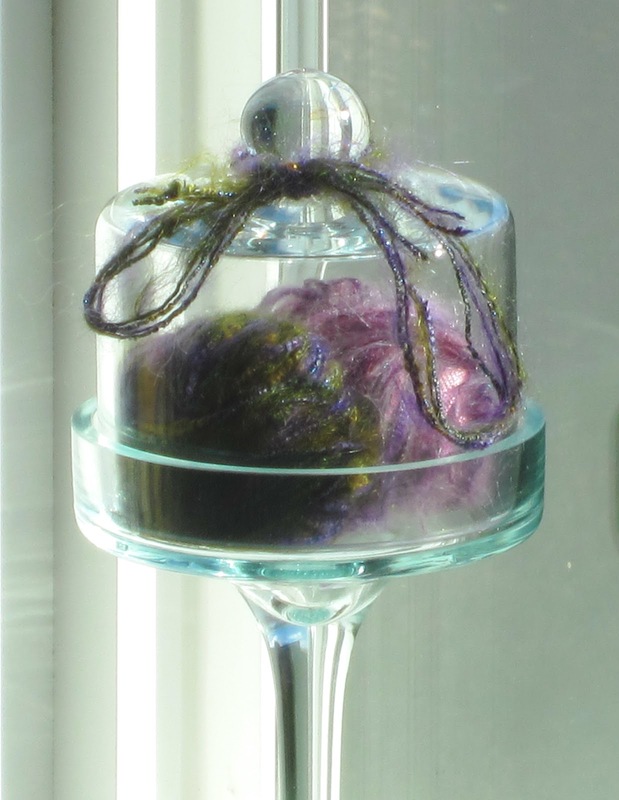 I wanted to show the variation of the colors of yarn in these pics. I think the colors look so pretty together for fall. I did enhance them just a bit to show more detail. Thanks so much for visiting. Comments are always appreciated! I would love to find some of those tall cloches..but I haven't seen any where I live. They are so pretty. You did a GREAT job! Thanks for stopping by. Cloches are such fun to decorate. I Appreciate the sweet comments! I love all of your cloches, but especially the wire mesh one. Thanks for sharing, Diane. Please come see my cloches. Couldn't find your email. You have been featured on my weekly Welcome Wagon Friday post. Welcome to our neighborhood! Your cloches are very pretty! I really love the wire one, I've been looking for one for a long time. The more natural, the better! I like the yarn tied to the other one, very cute! I just saw that you were on Brenda's Welcome Wagon post last week. Yay! Love your blog!